American University’s School of Public Affairs is pleased to announce the launch of Election Passport, a new online resource providing free access to a rich dataset of constituency election results from over 80 countries around the world. The goal of Election Passport is to enable researchers and students to engage in high-level analysis of elections on countries for which data are not easily available. From Andorra to Zambia, this site provides unusually complete data sets that include votes won by very small parties, independents, and frequently, candidate names that are difficult to locate. As an ongoing project, additional elections will be regularly added. Election Passport was developed by David Lublin, Professor of Government in the School of Public Affairs at American University, with the support of AU’s Center for Latin American and Latino Studies and the German Marshall Fund of the U.S.
We hope that you will find this to be a valuable resource and encourage you to share this announcement with your colleagues. Please contact David Lublin at dlublin@american.edu or (202) 885-2913 should you have any questions. If you have tried the dataset already, please feel free to leave any observations in the comments below. Should be valuable for scholars and policy makers alike! I am pleased to announce the public release of the Database on Ideology, Money in Politics, and Elections (DIME). The database was initially developed as part of the project on Ideology in the Political Marketplace, which is an on-going effort to conduct a comprehensive mapping of the ideology of political elites, interest groups, and donors using the common-space CFscore scaling methodology. [JMS: For details, see here.). 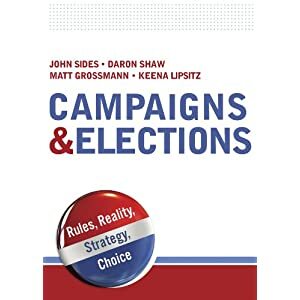 It includes records for over 100 million political contributions made by individuals and organizations to local, state, and federal elections spanning a period from 1979 to 2012. A corresponding database of candidates and committees provides additional information on state and federal elections. In addition, the database includes common-space ideal points for a comprehensive set of candidates for state and federal office, interest groups, and individual donors. The common-space CFscores allow for direct distance comparisons of the ideal points of a wide range of political actors from state and federal politics. In total, the database includes ideal point estimates for 51,572 candidates and 6,408 political committees as recipients and 13.7 million individuals and 1.3 million organizations as donors. Here, “ideal points” means an estimate of ideology. In essence, Bonica has developed an innovative way to measure the relative liberalism or conservatism of millions of political actors. It’s a treasure trove, and I hope people will make use of it. You can see some of the ways in which he’s used these data at his blog. Statistics. Congress. Vital. And Free. In case you haven’t seen this, the new Vital Statistics on Congress are available for free—in Excel and pdf—on the Brookings website. Thanks to Norm Ornstein, Tom Mann, Michael Malbin, and Andrew Rugg. Above is a little video they made. Some grouping of those into “conservative,” “progressive” or other. Rates of investigation, time taken. data actually required to reach any real conclusions. When Can You Trust a Data Scientist? This is a guest post from Andrew Therriault, a political science Ph.D. who is Director of Research and Business Development for Pivotal Targeting/ Lightbox Analytics. Pete Warden’s post “Why You Should Never Trust a Data Scientist,” which Henry Farrell linked to, illustrates one of the biggest challenges facing both consumers and practitioners of data science: the issue of accountability. And while I suspect that Warden—-a confessed data scientist himself—-was being hyperbolic when choosing the title for his post, I worry that some readers may well take it at face value. So for those who are worried that they really can’t trust a data scientist, I’d like to offer a few reassurances and suggestions. Data science (sometimes referred to as “data mining,” “big data,” “machine learning,” or “analytics”) has long been subject to criticism from more traditional researchers. Some of these critiques are justified, others less so, but in reality data science has the same baby/bathwater issues as any other approach to research. Its tools can provide tremendous value, but we also need to accept their limitations. Those limitations are too extensive to get into here, and that’s indicative of the real problem Warden identified: as a data scientist, nobody checks your work, mostly because few of your consumers even understand it. As a political scientist by training, this was a strange thing to accept when I left the ivory tower (or its Southern equivalent, anyway) last year to do applied research. The reason for a client to hire someone like me is because I know how to do things they don’t, but that also means that they can’t really tell if I’ve done my job correctly. It’s ultimately a leap of faith—-the work we do often looks, as one client put it, like “magic.” But that magic can offer big rewards when done properly, because it can provide insights that aren’t available any other way. Accessibility: The best practitioners are those who help their audience understand what they did and what it means, as much as possible given the audience’s technical sophistication. Not only is it a good sign that that they understand what they’re doing, it will also help you make the most of what they provide. Rigor: There are always multiple ways to analyze a “big data” problem, so a good practitioner will try different approaches in the course of a project. This is especially important when using methods that can be opaque, since it’s harder to spot problems along the way. Humility: Find someone who will tell you what they don’t know, not just what they do. These are, of course, fundamental characteristics of good research in any field, and that’s exactly my point. Data science is to data as political science is to politics, in that the approach to research matters as much as the raw material. Identifying meaningful patterns in large datasets is a science, and so my best advice is to find someone who treats it that way. I’ve enjoyed publishing a lot of data-driven stories since then, but I’ve never ceased to be disturbed at how the inclusion of numbers and the mention of large data sets numbs criticism. The articles live in a strange purgatory between journalism, which most readers have a healthy skepticism towards, and science, where we sub-contract verification to other scientists and so trust the public output far more. … If a sociologist tells you that people in Utah only have friends in Utah, you can follow a web of references and peer review to understand if she’s believable. If I, or somebody at a large tech company, tells you the same, there’s no way to check. The source data is proprietary, and in a lot of cases may not even exist any more in the same exact form as databases turn over, and users delete or update their information. Even other data scientists outside the team won’t be able to verify the results. The data scientists I know are honest people, but there’s no external checks in the system to keep them that way. This is a guest post by David Masad of Caerus Analytics. An elaborated version of this analysis is here. The Global Database of Events, Language, and Tone (GDELT) is an initiative to construct a catalog of human societal-scale behavior and beliefs across all countries of the world over the last two centuries down to the city level globally, to make all of this data freely available for open research, and to provide daily updates to create the first “realtime social sciences earth observatory.” Nearly a quarter-billion georeferenced events capture global behavior in more than 300 categories covering 1979 to present with daily updates. But does it work? Can we remotely observe violence conflicts around the world through computer-coded media reports? Building on previous analyses by New Scientist magazine and Jay Ulfelder, I will show that the GDELT data can indeed help us do that by examining GDELT data about the ongoing Syrian civil war. In particular, I will show that the violent events identified in GDELT correlate with death tolls at the national level. I will also show that GDELT events are correlated with the future registration of refugees. This preliminary analysis suggests that GDELT does capture underlying dynamics in the Syrian civil war, although the analysis also suggests where the GDELT data may fall short. Want Data on the Ideologies of 18,000 State Legislators? Here it is, courtesy of Boris Shor and Nolan McCarty. Boris’s blog post about the data is here. This is the first extensive data on the political views of state legislators. Well worth digging into! A TEDxSydney talk by Stanford political scientist Simon Jackman. His post about it is here.